Cute vintage 80s hooded snowflake sweater. 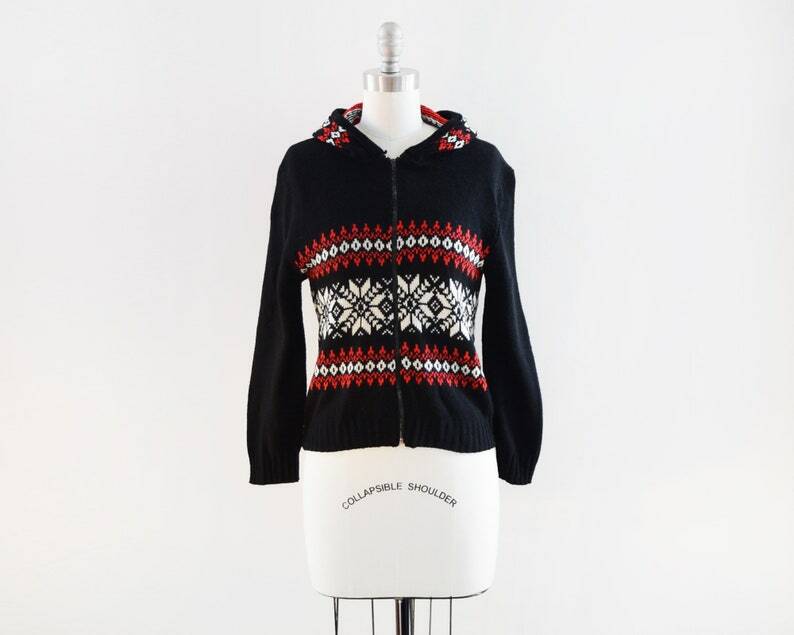 Black sweater knit with red and white snowflake and nordic pattern on the front and on the back of the hood. Metal zipper up the front. Ribbing on the cuffs and hem. The fabric has some stretch. Minor pilling to the fabric. Condition: Excellent vintage condition (see description for any flaws). This garment has been dry cleaned and is ready to wear. Measurements are taken laying flat and should be doubled where applicable. The size is just an estimate (unless stated on the tag), and vintage sizes are different than modern sizes. Please use measurements to ensure proper fit.